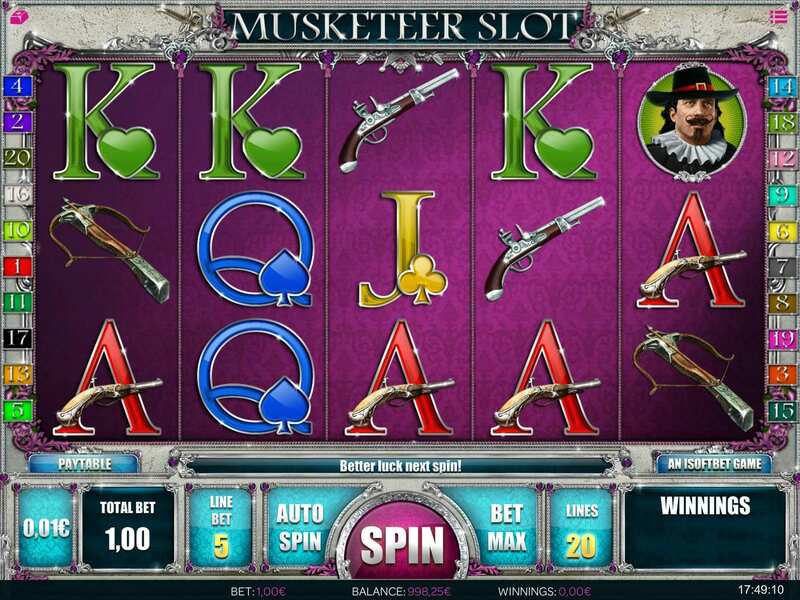 Here on Wizard, it's all for one and one for all – take a trip back to 17th century France with Musketeer Slot. Based on the book of adventure, romance and politics written by Alexandre Dumas in 1844, this game incorporates many of its iconic characters and themes. Enjoy a game with bright graphics and bonus features. This is a 3 reel, 25 payline game. 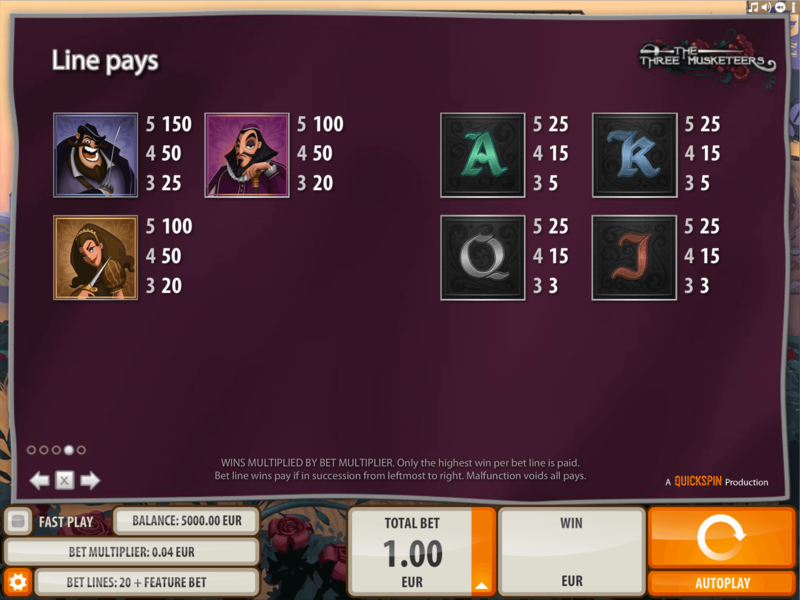 The paylines are not fixed in this game, meaning you have the option to change them to suit you. Bets can be placed from 0.01 and 1.0 per line. It can be played on most devices so you can play it anywhere, anytime. The graphics are almost 3D in style, making for a very realistic looking game. The reel is bold with royal colours, such as purple and blue, hinting at French royalty. The music feels like something out of a film soundtrack, with the clop of horseshoes and birdsong, and a score that hints of impending danger. Symbols include the three musketeers, various weapons such as a musket and crossbow, and eloquent letters to represent the card deck. The lower paying symbols are the card deck symbols paying up to 100 coins. The higher paying symbols are the heroes of the game, the musketeers. Land 5 of them and you’re looking at a payout of up to 5000 credits. · Scatter – a mysterious damsel, representing the treacherous double agent Milady, this symbol will pay anywhere on the reel. If she lands on the reel 5 times, she will launch the free spin feature. · WILD – this is the impressive looking castle and will substitute all other symbols on the reel. Keep an eye on this one as during the game, the wild will change into extended wilds on reels 1 to 5 at any point. This can also happen during the free spins. · FREE SPINS – the number of these depend on how many of the mysterious lady you have landed. There is the chance to win up to 20 free spins. Once the spins have been played, the winnings from the game can be multiplied up to 10x the bet. · AUTOSPINS – let the game do the work for you when you select the number of automatic spins you would like the game to play.